the USC School of Medicine - Columbia in conjunction with Palmetto Health Richland once again will offer the Finding Your Future shadowing program to prospective medical students in South Carolina. In an effort to connect University of South Carolina researchers interested in cardiovascular research, the School of Medicine's Department of Cell Biology and Anatomy and the Instrumentation Resource Facility are hosting the Carolina Cardiovascular Retreat on Dec. 18. A study led by Souvik Sen, M.D., Ph.D., chair of clinical neurology, indicates that individuals who experience migraines with a visual aura may have an increased risk of an irregular heartbeat called atrial fibrillation, and subsequently an increased risk of stroke. The study findings were recently published in Neurology. Three University of South Carolina's School of Medicine (SOM) faculty members have been named the 2018-2019 Emerging Physician Scientist (EPS) Faculty Fellows. John Walsh, M.D., has stepped down as academic chair of the Department of Orthopaedics to focus his energy on direct clinical care. Christopher G. Mazoué, M.D., has been selected to serve as the new chair. Jeffrey Perkins has relinquished his roles as chief of staff and associate dean for administration and finance for the School of Medicine to focus his attention on his role as USC associate vice president for business & finance and medical business affairs (AVP). 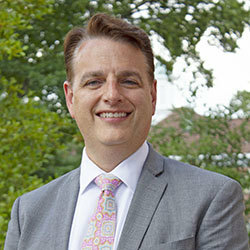 Executive Dean Les Hall selected Derek Payne to fill the new position of assistant dean for administration and finance. The School of Medicine is pleased to announce that Toni L. Bracey, director, contract and grant administration, for the School of Medicine, is the recipient of the 2018 William C. Gillespie Staff Recognition Award. Recognizing our students, faculty, staff and alumni for their hard work and support is important to the dean and the entire leadership team. Each spring service awards and alumni awards are presented to awardees nominated by their peers. Researchers from the University of South Carolina School of Medicine and the Chinese University of Hong Kong found that patients with endometriosis have an increased number of a unique class of cells in their blood. Last month, Jamie Sabo, a member of our inaugural class of Physician Assistant students, was selected as the only student representative on the American Academy of Physician Assistants Governance Commission. A research team led by Dr. Wayne Carver, chair of the Department of Cell Biology and Anatomy, is one of four inaugural teams of the Stimulus Research Program (SRP). If you are chosen from a select group of individuals, it is our hope that your time spent with us will fuel more of your fire to attend USC School of Medicine - Columbia and become a practicing physician. After an extensive national search, Dr. Eric Williams has accepted the position of Assistant Dean of Student Affairs. Mrs. Nancy Kress, one of the earliest members of the School of Medicine Library Circle of Friends, has kindly donated funding for purchase of a Clarus mobile glassboard for the second floor of the Library. The Dean's Distinguished Service Awards are annual honors established by the Office of the Dean to recognize individuals who demonstrate excellence in service, leadership, advocacy, and professional accomplishment. Researchers from the University of South Carolina's School of Medicine and College of Education recently received a $1.3 million National Science Foundation grant to study the best ways to encourage students to pursue careers in science, technology, engineering and math (STEM) through participation at informal learning sites. Seven School of Medicine students were selected to present their research at the 2017 South Carolina Medical Association conference in Charleston May 4-7. O'Neill Barrett Jr., MD, MSc., FACP, Distinguished Professor Emeritus and Chairman Emeritus of the Department of Internal Medicine, died July 1, 2017. He was 88. Dr. Christine Turley, professor of pediatrics and vice chair for research in the Department of Pediatrics, has been named the director of the Research Center for Transforming Health, a new School of Medicine initiative launching this fall. Alyssa Yancey has been appointed as the Communications Manager for the School of Medicine, effective July 17, 2017. The plan positions the school to fulfill their mission to serve the people of South Carolina and beyond through exemplary medical and health education, transformative research, and compassionate patient care. The Instrumentation Resource Facility (IRF) and SC INBRE will host a Research Symposium June 14 to 16, 2017 on the School of Medicine VA campus. Avery Nelson's project is focused on determining how long patients with bloodstream infections should be treated with antimicrobial therapy to achieve the best outcome. The summer 2018 edition of SC Medicine magazine [pdf] explores the School of Medicine's committment to "research that matters."